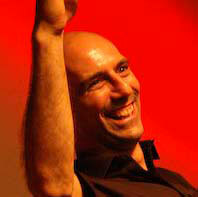 Mike King co-founded FRONTLINEdance alongside Rachael. He started dancing in the Yorkshire Dales back in the early 80’s but chose a career as an Outdoor Pursuits instructor and cave explorer. A climbing accident meant a big change. Now a wheelchair user, Mike re-evaluated his values and priorities. After a year of doing this, Mike attended a summer school with Candoco in which he loved, and shortly afterwards secured a Grant from Arts Council England for work shadowing the company. He later joined Candoco’s education team as an assistant. During the summer residency Mike also met Rachael and shortly afterwards FRONTLINEdance began. During this time, Mike also enrolled on a PGCE at Aberystwyth to start a teaching career. He later worked as a performer with Blue Eyed Soul on Frankenstein, directed by Liam Steel (formally DV8), Ariel projects with the Flying Piglets in New Zealand, an inclusive performance project with Scottish Dance Theatre, directed a show for Half Moon Young People’s Theatre and created a duet with Michal Popper. Graeae Theatre in conjunction with London Metropolitan University offered Mike a place on their Missing Piece Project – an acting course with a mini- tour at the end. This led to a TIE piece with Graeae around East-End of London Schools. When that tour finished he combined working as a drama teacher in a secondary school and work with FRONTLINEdance. Mike is currently a full time Drama teacher in a mainstream State Secondary in Kent delivering GCSE and A Level. When not working, Mike can usually be found on, in, or around water; Canoeing /Fishing / Swimming / Sailing. Mike believes that FRONTLINEdance gave him the foundation – confidence / knowledge/ professional work ethic /artistic integrity to allow him to re-invent myself (find his true calling as a teacher).